Last year Tokyo hosted a meeting of the International Standards Organization, including a session on blockchain technology to examine ideas around standards for blockchain and distributed ledgers. A member of the Russian delegation, who is part of their intelligence apparatus at the FSB, apparently said “the Internet belonged to the US, the Blockchain will belong to Russia.” In fact three of the four Russian delegates were FSB agents! By contrast, Chinese attendees were from the Finance Ministry, and American attendees were representing major technology companies, reportedly IBM and Microsoft among others. Let’s unpack this a bit. The Internet grew out of a US military funded program, Arpanet, and the US has been the dominant player in Internet technology due to the strength of its research community and its technology companies in particular. As we wrote in our most recent blog (http://orionx.net/2018/05/is-blockchain-the-key-to-web-3-0/), blockchain has the potential to significantly impact the Internet’s development, as a key Web 3.0 technology. Blockchain and the first cryptocurrency, Bitcoin, were developed by an unknown person or persons, with pen name Satoshi Nakamoto. Based on email timestamps, the location may have been New York or London, so American or British citizenship for Bitcoin’s inventor seem likely, but that is speculation. More to the point, the US is the center of blockchain funding and development activity, while China in particular has been playing a major role in mining and cryptocurrency development. There are many Russian and Eastern European developers and ICO promoters in the community as well. The Baltic nations bordering Russia and the Russian diaspora community have been particularly active. The second most valuable cryptocurrency after Bitcoin is Ethereum, which was invented by a Russian-Canadian, Vitalik Buterin. Buterin famously met with Russian President Vladimir Butin in 2017. Putin is himself of course a former intelligence agent. The Russians reportedly want to influence the cryptographic standards around blockchain. This immediately raises fears of a backdoor accessible to Russian intelligence. Russia is also considering the idea of a cryptocurrency as a way to get around sanctions imposed by the American and European governments. The Russian government has a number of blockchain projects. The government-run Sberbank had initial implementation of a document storage blockchain late last year. There is draft regulation around cryptocurrency working its way through the Russian parliament. President Putin has said that Russia cannot afford to fall behind in blockchain technology. Given the broad array of applications being developed for cryptocurrencies, including money transfer, asset registration, identity, voting, data security, and supply chain management among others, national governments have critical interests in the technology. China has been cracking down on ICOs and mining, but it is clear they think blockchain is important and they want to be in control. Most of their government concerns and interest appear to be centered around the potential in finance, such as examining the possibility of a national cryptocurrency (cryptoYuan). China would like to wriggle free from the dollar standard that dominates trade and their currency reserves. They have joined the SDR (foreign reserve assets of the IMF) and have been building their stocks of gold as two alternatives to the dollar. China’s biggest international initiative is around a new ‘Silk Road’, the One Belt, One Road initiative for infrastructure development across EurAsia and into the Middle East and Africa. One could imagine a trading currency in conjunction with this, a “SilkRoadCoin”. In fact, the government-run Belt and Development Center has just announced an agreement with Matrix AI as blockchain partner. Matrix AI is developing a blockchain that will support AI-based consensus mechanisms and intelligent contracts. 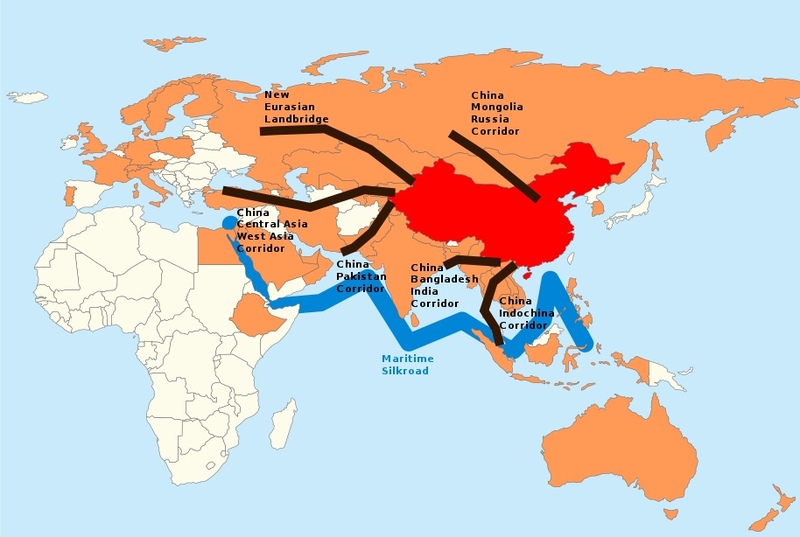 China’s One Belt One Road Initiative actually has six land corridors and a maritime corridor. The American military is taking interest in blockchain technology. DARPA believes that blockchain may be useful as a cybersecurity shield. The US Navy has a manufacturing related application around the concept of Digital Thread for secure registration of data across the supply chain. In fact the latest National Defense Authorization Act requires the Pentagon to assess the potential of blockchain for military deployment and to report to Congress their findings, beginning this month for an initial report. What is clear, is that blockchain and distributed ledger technology have the potential to be of major significance in national security and development for the world’s leading nations. A range of efforts are underway by government, industry, and academia to understand blockchain technology and cryptocurrencies, to enhance the technology, and plan for the future. In that context, we see potential in the technology to impact many facets of society and global dynamics. That potential is now sufficiently developed for us to advocate a more visible presence by government agencies in helping shape the policy and academic research. We encourage the US government to increase engagement with blockchain and distributed ledger technology. This can include funding research in universities, pilot projects with industry across various government agencies including the military and intelligence communities, the Federal Reserve, and the Department of Energy, NOAA and NASA, in particular. Also the federal government should pursue standards development under the auspices of the NIST and together with ISO. Individual state governments are also promising laboratories for projects around identity, voting, and title registration. Information has always been key to warfare. But there is little doubt that warfare is increasingly moving toward a battlefield within the information sphere itself. These are wars directed against the civilian population; these are wars for peoples’ minds. Blockchain technologies could play a significant role in these present and future battles, both defensively and offensively. America was founded and grew rapidly largely in the context of the Industrial Revolution. The Information Age provides a similar opportunity and responsibility to set the course for the next century and beyond. As before, getting it right will not only assure the country’s continued success and leadership. It also arms the nation to solve problems that affect all of humanity. Stephen Perrenod has lived and worked in Asia, the US, and Europe and possesses business experience across all major geographies in the Asia-Pacific region. He specializes in corporate strategy for market expansion, and cryptocurrency/blockchain on a deep foundation of high performance computing (HPC), cloud computing and big data. 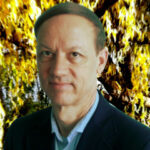 He is a prolific blogger and author of a book on cosmology.